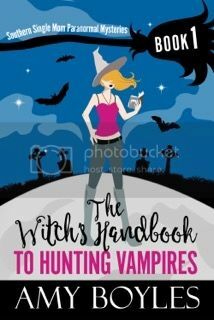 Susan Heim on Writing: The Witch's Handbook to Hunting Vampires Book Tour: Giveaway for a $50 Amazon Gift Card, Signed Book and More! The Witch's Handbook to Hunting Vampires Book Tour: Giveaway for a $50 Amazon Gift Card, Signed Book and More! Amy Boyles grew up reading Judy Blume and Christopher Pike. Somehow, the combination of coming-of-age books and teenage murder mysteries made her want to be a writer. After graduating college at DePauw University, she spent some time living in Chicago, Louisville, and New York before settling back in the South. Now, she spends her time chasing two toddlers while trying to stir up trouble in Silver Springs, Alabama, the fictional town where Dylan Apel and her sisters are trying to master witchcraft, tame their crazy relatives, and juggle their love lives. Enter to win the following prize pack!